When these three conditions are met, even the strongest, healthiest body may fall subject to feeling unwell. When hypoglycemia, dehydration and hot temperature occur together, they may weaken a healthy body to the point it collapses. Each of the three, by itself, produces a weakening effect on the body. Combined, their action is sufficiently strong to disturb the body’s ability to regulate its temperature, normal breathing and cut off the supply of energy meant to keep us up and about, ending in our collapse. In a normal, healthy individual, these three riders of misfortune are but debilitating. Their effects are temporary and once the body gets what it needs, that being sugar, water and a cooler environmental temperature, it will slowly, but surely resume its normal functioning. However, existing medical conditions such as diabetes, heart disease, exhaustion etc. and several other risk categories such as old age may lead to this unfortunate reunion of circumstances affecting certain people more than others and potentially endagering one’s health and wellbeing. 1) The elderly and young children. 2) People not eating sufficient carbohydrates. 3) Diabetics and heart disease sufferers. 4) Anyone with a chronic illness. 5) Being a bigger person. 6) People not drinking enough liquids. 7) Anyone on a restrictive diet. 8) People working or training outside. Or those suddenly increasing exercise difficulty. Hypoglycemia, dehydration and high environmental temperatures pose serious health risks as a result of their combined adverse effects. Knowing the effects each of the three has on our body is the key to understanding how their combined action can put even the strongest individual down. What is hypoglycemia and what does it do? 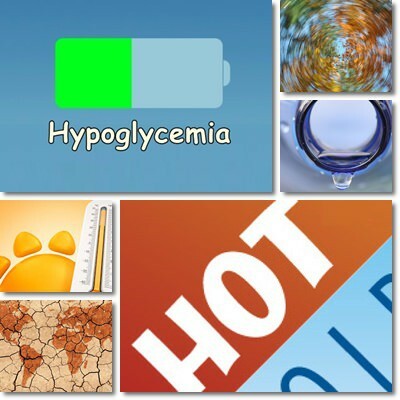 Hypoglycemia refers to having low blood sugar levels (under 70 miligrams per deciliter of blood). Hypoglycemia manifests itself as dizziness or lightheadedness, shaking, chills, pallor, inexplicable sweatiness, clamminess (cold, sticky and moist hands and feet), fast heartbeat, confusion, irritability, possibly hunger, nausea, poor coordination and vision problems, generalized weakness (you feel you don’t have the strength to lift your arms up or simply can’t feel your legs anymore), a feeling of impending death, feeling a lump in the chest (or chest tightness) and fainting. Hypoglycemia can occur in perfectly healthy individuals as a result of burning all of our energy and not eating to get more, or in diabetics, in which case their condition can suffer complications. Experiencing hypoglycemia for the first time can be very frightening because of the terrible feeling of losing control of your own body and not being able to just regain control of legs and arms feeling or regulate breathing, heart rate. The panic that comes with such an experience can amplify symptoms and make it difficult for us to remedy the situation on the spot. What makes it even more difficult is that we might not recognize symptoms at first and not realize our blood sugar levels are going down. Fortunately, hypoglycemia is fairly easy to reverse in individuals with no history of diabetes. Simple carbohydrates or glucose, about 15-20 g will help keep us on our feet until we can have a proper meal and restore our energy supply. A couple of tablespoons of honey, raisins, candy, chocolate, sweet biscuits, one or two cookies can help us not faint. We will still experience an abnormal feeling of weakness after that, but it is not enough to have us collapsing in the street. Diabetics should closely follow the instructions given to them by their doctor. Drinking water also helps. In my experience, it is important not to panic. Always have some honey or sugar packages or a bagel with you, find a quiet place to sit down, a sidewalk or park bench and just eat something. Once you feel the senses coming back to your arms and legs, it is best to think about having a nice meal to get you back on your feet. Do not think about not eating. Even if this is the furthest thing on your mind, eat. What is dehydration and what does it do? Dehydration means our body has lost enough of its fluids that it experiences a shortage that prevents it from working as it should. Fluids are present everywhere in our body, in our blood, skin, mucous membranes (throat, nose, mouth, eyes) and every functioning cell. Our body is always trying to maintain a balance between the fluids we lose (through evaporation through skin, exhaling, sweating, kidney function, eliminating stools, vomiting, diarrhea) and the fluids we take in. When we don’t drink enough water, we create an imbalance which leaves us suffering adverse effects such as low blood pressure (losing water diminishes our blood volume), fainting, headaches, confusion and lightheadedness, fatigue, nervousness, loss of muscle control. The older we get, the less we experience the thirst sensation which is why the elderly represent a risk category for dehydration and are the ones most likely to faint in the street during summertime. And along with water, we lose minerals and electrolytes such as potassium, which further accentuates our symptoms. The symptoms of dehydration and hypoglycemia intersect so we might find ourselves not knowing which is which. However, there is an instance when we may experience both: in hot weather when temperatures are high and rising. Hot weather and feeling sick. When it’s hot outside, we don’t feel good. The higher the temperature, the more likely it is for many of us to simply feel sick. The feeling of unwell in high temperatures takes many shapes: drowsiness, lightheadedness, confusion, irritability, inexplicable fatigue, dry skin, mouth and chapped lips, nausea, vomiting, high heart rate, excessive sweating, rising body temperature (feeling hot inside or feeling like skin is too hot) and even loss of consciousness. High temperatures create the perfect setting for dehydration and hypoglycemia to occur because they make us lose liquids fast and not want to eat anything. When it’s hot outside we experience thirst, a first sign of dehydration, and an aversion to food and the idea of eating itself, which is a first step towards getting hypoglycemia. Symptoms such as nausea, lightheadedness, dizziness, headache, confusion, irritability, inexplicable fatigue, sweating, increased body temperature, thirst, hunger and loss of muscle control hit us so hard that we get confused with regards to what is causing them and what we can do to improve them and feel better. Given that symptoms are brought on by three different factors and somewhat amplified by each of them, we might not identify their primary cause immediately and panic. Getting panicked can alter our perception of the situation and impair our ability to find a quick solution or seek help. We are confused because we don’t really understand if we need water, food, rest or something else. Symptoms have such a rapid onset and are so overwhelming that we don’t realize we have to meet our body’s most basic needs: water, food, rest and cooling down. 1) Drink water (or sports drinks for rehydration) to raise of plasma levels and blood pressure and keep us from fainting. 2) Seek shade or a cool place if it’s too hot and rest. 3) Eat something sweet, honey, chocolate, a cookie, a small can of soda, a slice or two of bread, a bagel (preferably starchy, sweeter foods) to raise our blood sugar levels fast. 4) Go to the nearest pharmacy and get an oral rehydration solution (with potassium) to combat dehydration. 5) Eat to regain strength. A balanced meal containing sufficient carbohydrates, moderate amounts of protein and little fat is ideal. Avoid large meals. Too much food will slow down digestion and recovery and symptoms may improve at a slower rate. 6) Apply cold water to hands, arms, face, neck, chest and even feet to cool down. 7) Avoid any strain (bending to tie a shoelace, lifting a heavy bag or engaging in physical exercise), alcohol and caffeine.